Well, it turns out a lot of people are reading this, and I'm listening to what you're telling me. I ran around taking some photos! None of outside, because frankly, I don't live in the horsey part of Kentucky, it's November, so it's only marginally green outside, and uhh, oh yeah. I live in town. I could shoot photos of the empty crack house across the street, or of the other old houses (in various states of disrepair) on my daily walk, but that will have to wait for another time. 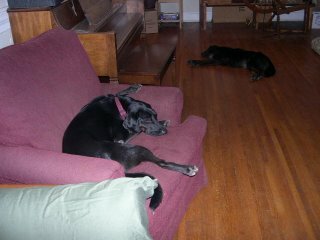 Also, my daily life is very small, especially since, thank goodness, we got rid of the crack house occupants! Many days I don't get into the car, I work from home, I walk a mile with the dogs. I check out the kale seedlings in the garden. I cook dinner. I've been pretty busy with work though, so I'm going to share what is happening with you! That's (left to right) Mountain Colors Twizzle (merino and silk), Sheep Shop Yarn Company Sheep Number one (100% wool from Uruguay), Dalegarn Baby Ull (washable wool, love this stuff already) and the plum colored yarn is Sandnes Alpakka (100% alpaca.) 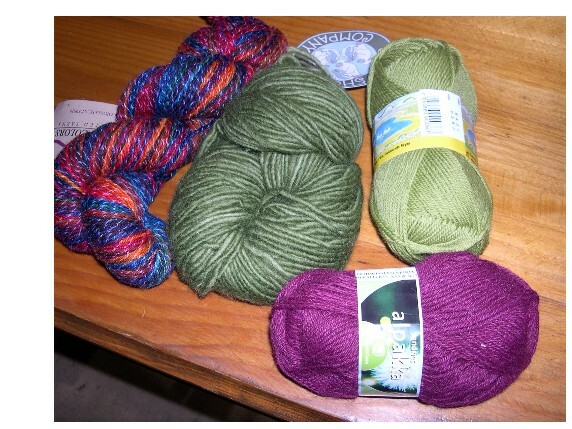 I can't wait to knit on the couch with this stuff! Yum. Been struggling with a very sore lower back. That could be because A) I don't exercise much, B)I don't stretch much C) I sit too much or D) I keep leaning too close in to the computer because I can't see. If you've ever felt err, unraveled, or depressed, or know anyone who has, this is a chance to donate your UFOs to the cause. 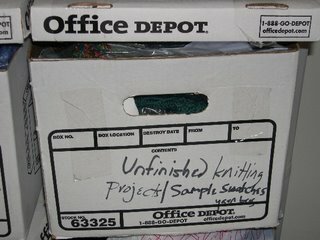 (UFO=unfinished object) These projects will indeed be ripped out and/or sewn together, made into blankets for charity or skeins donated to knitting in schools programs. For anyone who's ever been in a slump, you're not alone. Here's a way to show you care. 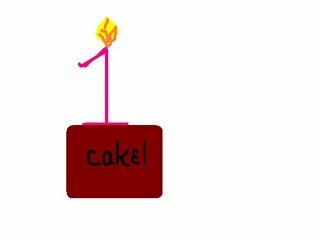 drawing caption: Joanne's poorly rendered cyber cake and candle! This week is my blog's one year anniversary. Hard to believe, huh? A wise friend once told me that anniversaries were good times to evaluate things. How is this relationship going? Are we meeting all our goals? Still enjoying everything, are we? I didn't want a "tell all" kind of blog. Also, whenever I got the least bit controversial in my writing, or on my blog, I've gotten some unpleasant feedback. (those anonymous phone callers who tell me to "Go to Hell!" weren't so enjoyable...and yes, I've heard from my very own conspiracy theorist.) I've learned from this that I can discuss interesting things here, enjoyable things, and even upsetting things, but that unless I want to be threatened again, I'll just stick to the non-controversial stuff here. I've decided that since I get paid to write controversial things (like, gasp! my columns on religion!) on occasion, so I don't have to take the risk here unless I absolutely feel the need. I've met some goals I hadn't intended to meet...and it's been fabulous. Wonderful people from all over the world contact me. I love this! I love learning from you and emailing with you. Keep it up! 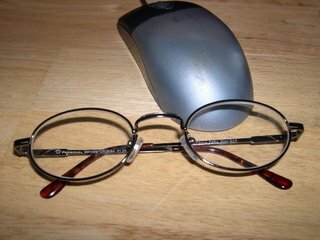 The blog has also helped to boost my web presence (goal met) and that's helped some old friends and such to find me. Just in the last few weeks, I've gotten back in touch with a teacher and mentor who truly inspired me as a writer...she continues to inspire me, now that I know what she's been up to! Then, out of the blue, I heard from an Australian friend that I'd met long ago when I lived in Israel as a 16 year old on a study abroad program. These new and old connections are very important to me. The blog and some web presence worked to build more community and relationships for me. Last, I am learning from feedback. A cousin I saw at Thanksgiving said, "Your blog has so many words! Ours just has photos!" She's right...I'm a wordy gal. I'll try to be pithy and put up some more photos. This week, I'm excited about the knitting and revisions I've been doing, and I hope to have more visual things to post soon. This blog thing, this relationship seems to be working out, now that I'm thinking about it. So, folks who read my blog on occasion, why do you read it? What do you like? What could I do better? Join in to commemorate my first blog-iversary in style. I wanted to drop in to tell a couple of brief funny stories. On Friday, I discovered that our food shelf in the basement, the one with all the handmade preserves and canned goods, the bottles of wine, etc. had drops and splashes and puddles of a molasses colored, goopy, sticky viscous stuff on it. I was panicked...it seemed oily, yet was water soluble. I couldn't find out where it was coming from. Husband was lecturing to his huge Intro. Biology class, so I called my father. In our long distance consultation, we couldn't figure it out--and I had a student arriving for tutoring at any minute. Finally, a couple of hours later, the biologist comes home to help solve things. At first, there was gnashing of teeth and worry. Did we have a weird leak? What was this mysterious stuff? Oil? Rotting stuff? Chemicals? Resins?The stuff came from a punctured can of Pepsi. The one medicinal soda pop can, kept for upset tummies, etc. sprung a leak, and sprayed the rest of the food...sticky to clean up, but definitely not toxic. We laughed, and enjoyed the unusual pleasure of getting to eat lunch together, at home, during the week. When imagining the worst, think instead of a drippy, spritzing soda can! Today, I discovered I couldn't get an essential program (Word) to work on my computer. I tried everything and am considering re-installing it all. This does keep a writer from working... In the midst of this, I baked two loaves of the very good crusty bread...so we could freeze some and have it when we get back from our Thanksgiving travels. I sliced some of the bread and tasted it. It was good. I left the sliced bread to dry a bit before freezing, so it doesn't stick together in the freezer. I continued re-knitting my new Cuddle Coat, which will shortly be posted on my website for sale, with new improved photos, since the copyright on the pattern has now reverted to me. Then, I hear licking. I hear crunching noises. Harry and I run to the hall and discover...Sally thinks the fresh bread is very very good. She has eaten what looks like 3 or 4 slices of it...since it's no longer on the cutting board on the kitchen counter. One slice, half-eaten, is in her mouth. Another slice waits for her on the kitchen floor. I take away what I can, say "NO!" and Sally looks scared. Then she realizes I will not hit her. I won't scare her into having an accident. She looks repentant, and then goes to clean up any crumbs that are left. After all, that bread was good. 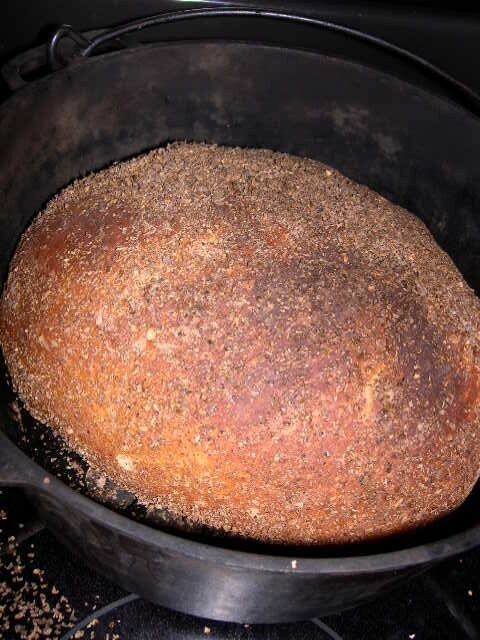 This is my cast iron Dutch Oven. Today I wrote an ode to it; I feel that strongly about it. I've used it and its little trivet and the top to: cook whole meals in my fireplace, bake on top of a stove when my oven in Buffalo, NY was infested with mice (yup, gross, I know) and serve whole winter time stews and roast chickens inside of it. Now, I add the perfect bread to its talents...the recipe from the NY Times calls for a covered pot... I didn't buy this oven. In fact, it happened to us. The husband volunteered to help clean out a neighborhood basement in Durham, NC, when we lived there. (we had a friendly neighborhood, I now realize, I miss it.) Amidst the 20 year old chowchow and other scary canned delights that nearly killed him, he found this dutch oven. It was rusty and sad. The new owners gave it to him. I used vinegar and lemon and scrubbed and here it is, a trusty friend, back again. 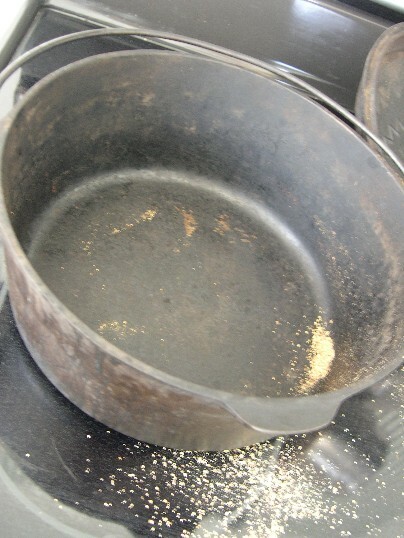 I'd buy more cast iron if I had space in my kitchen to store it. I'd also have a bigger fireplace so I could do fun cooking that way in the winter time, but for now, I'll stick with the fancy electric oven that the last owners left. It works just fine and there are no mice involved. That's good. 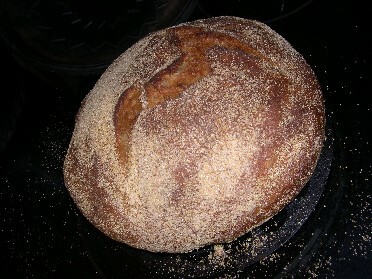 This is the whole wheat version of the no-knead bread recipe. What did I do differently? I used 1 and a half cups of all purpose organic flour, and one and a half cups of whole wheat organic flour this time. I coated with cornmeal instead of wheat bran. The results? Still incredibly good. I'm starting loaf number 3 tonight. We're thinking that if I keep doing this, maybe I'll save enough money (by skipping the not so good grocery store bread) to buy another cast iron dutch oven. Or not. In any case, the bread is danged good but I do miss kneading a bit, since this is no-knead bread. I am taking advantage of the tons of rain and dark here to knit a little color into my designs. I'm working up swatches for a December deadline and I'm using this silk I bought from Ohio Valley Natural Fiber at Maryland Sheep and Wool Festival. It's bright and cheery! The rain has been so bad here that I had to take an abbreviated walk with the dogs. Then everyone got dried off, I had to change clothes, and it's been an effort to get them to go outside again. That's a lot of rain. 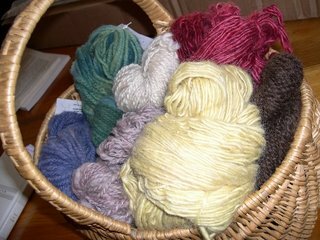 I think that when I'm not down about other things, I really like the dark time of year...lots of time to nest, make warm drinks, and cuddle up...plenty of knitting and spinning time. However, when I'm stressed, I sleep a lot, feel crummy, and generally can't cope, no matter the season. I've already accomplished more today than in the past two days. Perhaps the fog is lifting, metaphorically. Literally? It's dark, muddy, damp, and a great time to be inside, knitting. Gotta go start that bread rising. 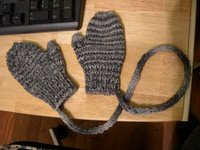 So, this week I started making mittens for my one year old nephew. 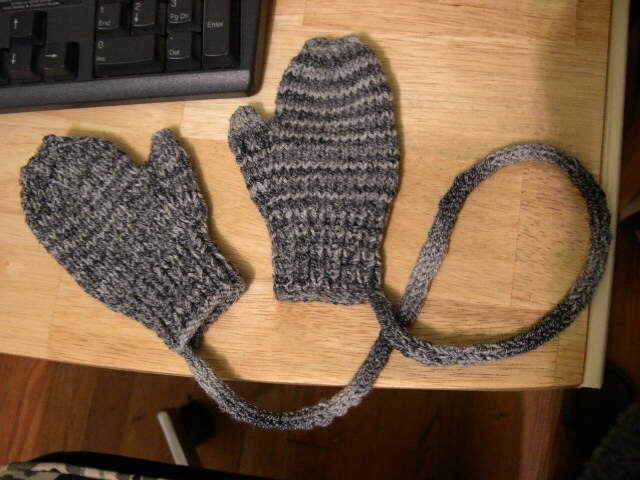 His mom had requested gray mittens. 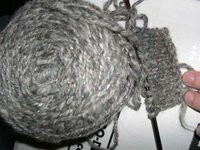 I had tons of gray fiber, so I spun up some gray Icelandic wool, gray handdyed silk, and naturally gray alpaca. I made a three ply yarn. I knit this swatch. Maybe it was the cloudy weather or the bad karma around here, but I just couldn't do it to a little boy. This gray looked like a little old man and I couldn't continue. I was sad. So I stopped that right away. Then, I refocused. I made myself re-examine the situation. I looked at the humongo stash and said, "Oh, sock yarn, of course, it's machine washable." I broke through the "but Joanne wanted that color yarn for her own socks" barrier (my socks will just be shorter, that's all) and here's what I knitted up. Mental Anguish, phonecalls, etc. 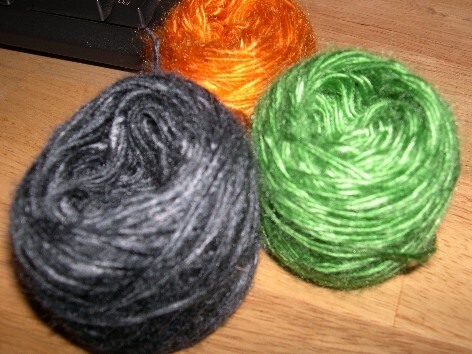 in choosing yarn and thinking about mittens, which shows Auntie Joanne really loves you: about 20 hours. At least. Cute Nephew getting mittens for his 1st birthday? Priceless, of course. I've been going through a slump lately. Not feeling great, struggling with all sort of things, and feeling sort of down. When that happens, I usually remember to bake bread. It makes me feel somewhat better. I've been doing this, with largely positive results, for the last 20 years, so I've had some practice and I've made a lot of bread. Then I tried this recipe from the New York Times. This bread had possibly the best crust and the most flavorful crumb I've ever produced. It was like the $4-$8 loaves that one buys at the slow food, artisanal bread bakeries that sadly, we do not have in Bowling Green. It rocked. The two of us ate this whole loaf in less than a day. I've started making more. It's that good. This time, I'm doing a whole wheat version. What could possibly be bad about bread that looks this good? PS: Please remember to say hi every now and again so I know you are reading and I feel motivated to keep posting. Keep me company out here in cyberspace! My article, Dyeing with Marigolds, is up at Fiber Femmes Ezine! That's the good news. I was so flattered when the editor read my blog and asked me for the article. Otherwise, this week has been filled with upsets. Silly and some not so silly things, but unsettling. For instance I'll let you laugh over the silly ones with me. Last night I looked forward to a wonderfully quiet night of sleep, since the snoring scientist was out of town and I was tired. 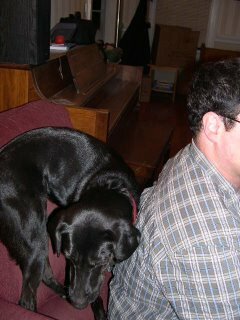 Alas, Harry the dog decided he didn't feel good and wanted me to know it. After several trips outside (one at 3 AM) and some soothing, he fell back to sleep in his crate. Sally, good girl that she is, just slept on. Feeling out of sorts? Several nights without much sleep certainly aren't a recipe for fixing things. You just might get used to staying up all night, like Harry. These fibery successes almost made up for my overzealous trash collectors, who decided to throw away my compost pile this morning. Yup. No more compost. We do have the most thorough trash collection here that I've ever seen. Too bad it was compost. Sarah's comment to my last post reminded me of something. Now, I hope I don't have to be quite so embarrassed when we travel overseas or see our British friends. For years, I've had to preface political conversations with my friends abroad by saying, "I don't agree with..." so that I wasn't immediately besieged by eager debaters. It's hard when many in the world don't think your country is doing the right things. The recent elections will hopefully allow our country to turn around and cooperate with others in the world. I hope it will all be for the better...more peace, stability, and less warmongering. I love long meals with friends, where we linger over good food and wine and discuss big ideas. We don't have any tickets to Europe just now, but I'm hopeful that when we do, I'll be able to smile at my friends as we discuss some improvements we Americans have made. For now, I'm grateful that I have a dinner invitation this evening right here in Kentucky. Let the discussions begin! We've reached the time in fall semester when sleep is at a premium. The professor is going away for a conference with his students, and we're all looking forward to the quiet and some shut eye. No more late nights writing exams, please! I almost said, "Let sleeping writers lie" but I don't want to insinuate here that I lie! Well, you know what I mean. 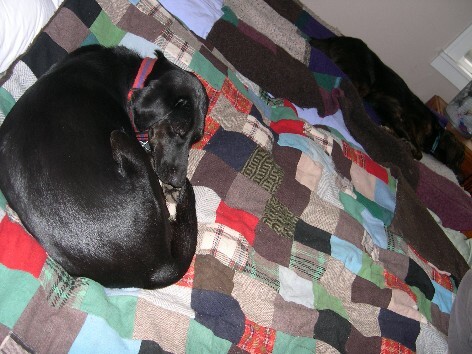 I'm looking forward to some time on the couch, knitting with the dogs. Last night I took the silk knitting out on a little fieldtrip to City Hall (just a few blocks from home) in order to help support the mayor. She wanted our town to be part of the US Mayors Climate Protection Agreement. In brief, this is a way for cities in the USA to sign up for the Kyoto Protocol in a grassroots effort and to make a commitment to reduce global warming pollution. If you voted, thank you for exercising your civic duty. I'm excited that a woman will be in charge of the House! No one I vote for seems to win locally, but I am especially pleased that more women will be lawmakers now. I hope one day that there will be an equal number of male and female lawmakers in places of power. I don't say much about my husband the professor here, but I'm very excited about one of his most recent projects. 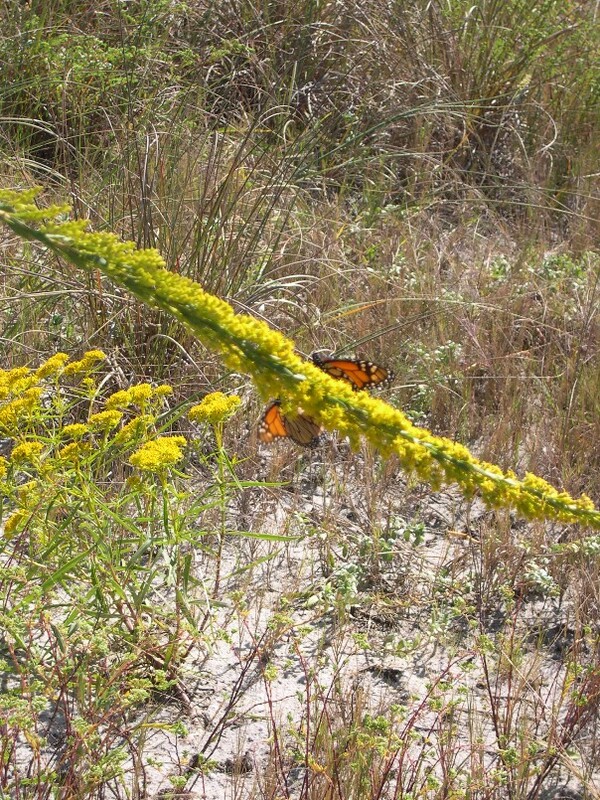 He's launching a new database, the Kentucky Butterfly Net. 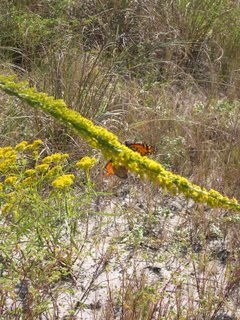 This allows people all over the state to see nearly 50,000 documented sightings of over 2,450 species of butterflies and moths, from 1872-2006. Now that's an achievement...and a wonderful contribution to state research. I've recovered enough from the Sally love fest (thanks for the warm congratulations, everybody) to get back to the fibery stuff...while she slept next to me. 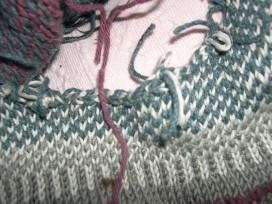 This weekend, the biologist was away, and I enjoyed myself by sitting and knitting on the couch. A lot. A friend of mine and a colleague of my husband's is having a baby and there's a baby shower soon. I used my newfound knowledge from Mason-Dixon Knitting to embark on a baby present. 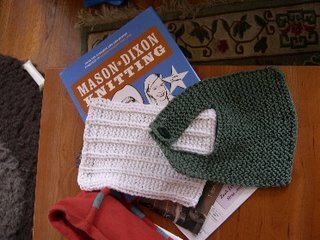 I interrupted my regularly scheduled knitting to do this bib and burp cloth. My fibery mother-type friends have advised me that more burp cloths are needed. We'll see what can be done about that by next week's shower. I have mixed feelings about knitting for babies. I believe that every baby deserves handmade things to welcome him/her into this world. However, despite 6+ years of our best efforts, we haven't been able to get pregnant. While trying is sometimes fun, the whole thing becomes less fun when everyone you know is having kids but you. Plus, the drugs, blood tests, and doctors' visits? Not fun. I'm on a hiatus from the doctor stuff, since there's theoretically nothing wrong with us, after all those tests. So, now I don't knit baby things for everyone...when it doesn't seem emotionally taxing, I knit. When it does, I rush out, purchase something suitable, and move on. 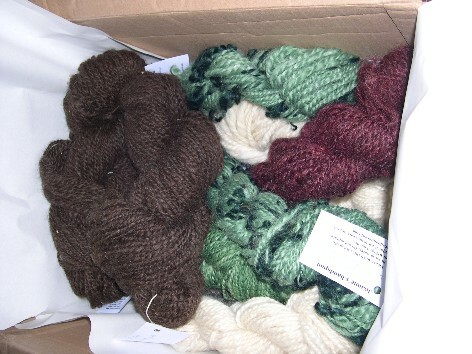 On the good news front: This box of my handspun (photo shot when box was halfway full) has been sent off to Berea College's Log House Craft Gallery today. It was extra taxing at the last minute because our household ran out of packing tape. We had three different rolls of tape floating around the house. Three. All three ended at the same time, before this one box got taped up! What are the chances?? Luckily, the drugstore's just up the street, I taped up the box in the parking lot, and off it went. Whew! Glad that's out of the office...now there's room for me to start spinning up some more. A friend of mine has just posted her beautiful designs on a gorgeous new webpage! Check out Heartland Knits online and at your local yarn shop for more information. Some may think, hey, what's that silly Joanne doing, promoting other knitwear designs on her website? Well, I believe in synergy. 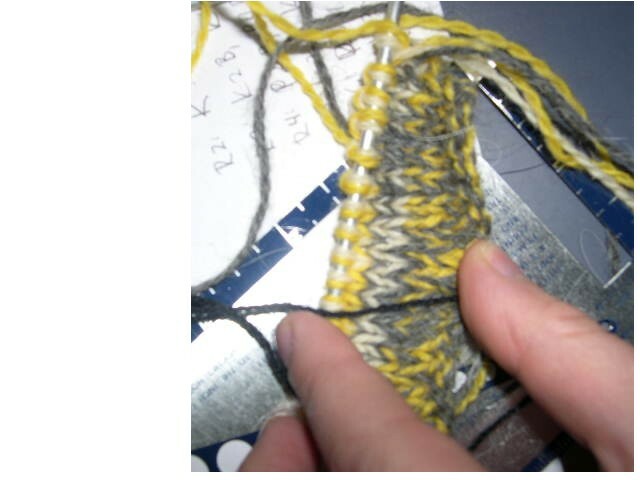 Knitters knit many patterns over their knitting lives, and Vicki designs some amazing things. That's why I'm telling you about her. Check it out. Oh. One last thing. If you're a U.S. citizen, PLEASE VOTE TOMORROW. Here are the sneaky Sally photos I meant to post a couple of days ago. Blogger appears to be back to normal now, I hope. 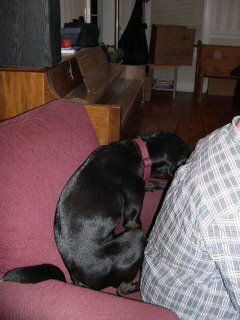 but you know, a dog just can't get comfortable without turning around at least once or twice, of course. Today we are celebrating the one year anniversary of adopting Sally the dog. From the very first time we saw her, she's been inching her way into our hearts. We visited this rural shelter to check out a border collie, who ended up being afraid of the husband. He's a big guy. We understood. The volunteer led us over to meet other dogs. Sally was so scared of everything that she crouched, practically under our car, for the entire 20 minutes we met her. All the way home, the husband was saying, "We can't have a second dog. We can't manage a second dog. It would be complete chaos." I said, "Ok, alright, I hear you." Three days later, we were cleaning up after dinner and I said, "So, have you thought about those dogs we saw at the shelter?" He couldn't get Sally out of his mind. (heck, I couldn't get about 5 dogs out of my mind) He said,"So, I'm going out of town, but if you and Harry wanted to go visit her, see if the two dogs got along, and if you guys adopted her, well, I'd be ok with that." Well, no way was I going to let it happen that way... 'cause I knew chaos would definitely happen if I got another dog, and I didn't want to be completely responsible for the decision! I quickly made an appointment to meet Sally again, with the husband and Harry in tow. Sally convinced us right away that she was the dog for us. She sat on the husband's foot continuously for the whole second visit, wagging her tail. Harry went nuts with excitement. The shelter folks recognized the husband from the university and said, "Well, if you want this dog, you can have her. We trust you biologists. Just return her to us if something goes wrong." No paper work, nothing. We made a donation and suddenly we were driving 30 miles home in the dark with a dog at my feet on a blanket and Harry in the crate in back. Meanwhile, the dog, Sally the dog, was so nervous that she had an accident--yup, #1 AND #2... on the way back. Even so, there was no way I was ever letting her go back to the shelter. Now, when people visit, Harry leaps into their arms and kisses them. Sally barks, and she's nervous. She sits on my foot. She keeps me safe. She's wary, as any good dog should be, about new people...but no doubt about it, she's 100% convinced we're ok. Every day, I love her more for it.